...I am going to buy myself this watch. 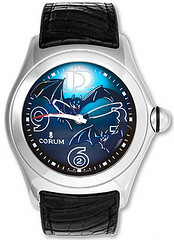 We saw the Corum bubble watch series in a jewelry store in Beverly Hills a few years ago, and I haven't been able to get this model ("Bats") out of my mind. Blogging this so that I remember to buy it someday soon!